More than 26 people have died and over 1,000 others are infected as the Philippines declares a major measles outbreak in its capital city of Manila and other regions. On February 7 the Philippines Health Secretary declared measles outbreaks in the regions Luzon, Central Visayas and Eastern Visayas. Outbreaks in Manila had already been publicized in late January, so this marked a new front in the current outbreak. Getting an exact figure on the death toll is proving difficult, but at the time of writing official figures say 26 people have died with several more cases waiting to be confirmed. Some reports put the current death toll as high as 57 people in Manila alone. It is critical to remember that official death tolls have to be corroborated, so it is not unusual for there to be such discrepancies. Health Secretary Francisco Duque III told Rappler, ”We are expanding the [declaration of the] outbreak from Metro Manila to the other regions as cases have increased in the past weeks.” Duque also said that the government urges people ”to strengthen the surveillance of new cases and to alert mothers and caregivers to be more vigilant”. 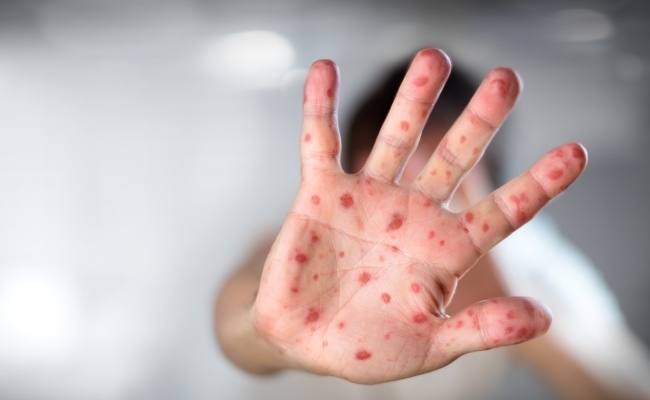 Health experts in the region have said that, while it is important not to panic, if a child displays any of the early symptoms of measles such as a high fever, it is critical they go to the nearest health center at the earliest opportunity. One of the primary causes of this outbreak appears to be a breakdown in vaccination uptake. The BBC reports that in 2016 the immunization rate was around 75 percent, well below the 95 percent threshold for herd immunity. Unfortunately, in 2017 that rate fell to just 60 percent. Though we do not have official figures for 2018, based on other evidence there has been no sign of a letup in that downward trend. The BBC estimates this means there may be as many as 2.4 million unvaccinated children, the vast majority of whom could have been protected. So why are so many parents choosing not to get the measles vaccine in the Philippines? French firm Sanofi’s Dengvaxia vaccine has, on the whole, been a major breakthrough in the prevention of dengue fever, an illness that causes a dangerously high fever, severe headaches, pain, vomiting and heart. Dengue fever can be fatal for some people, particularly if they have an underlying health condition. The vaccine has about a 65 percent efficacy rate, making it a powerful prevention tool. However, in 2017 reports in the Philippines started to emerge of adult patients who had been given the vaccine developing severe bouts of the illness, also known as dengue hemorrhagic fever. This was despite clinical data in other regions showing remarkable effectiveness. Sanofi contends that there was an issue that it made clear to the country’s government. There was a possibility that, in those who had never been exposed to the virus before, the vaccine could worsen the disease and lead to a higher risk of more serious health effects. The government proceeded to withdraw Dengvaxia and heavily politicized the health scare by blaming outside forces, such as Sanofi. Critics pointed out at the time of rollout that the government had extended vaccinations at break-neck speed and with little care for instructing which patients should or should not receive the vaccine. It is worth pointing out that, to date, there have been no confirmed fatalities resulting from the vaccine, even though the government has been accused of playing into those fears. Regardless of who was at fault for this health scare, it appears the government’s grandstanding has now backfired. Public confidence in vaccines as a whole has dived. Parents, scared by the dengue cases, appear to have written off all vaccines as potentially hazardous. The government of the Philippines is now urging parents not to confuse the two vaccines. As we saw in the West with the fake MMR scare, though, once the damage is done it is incredibly difficult to restore public confidence, particularly in an age where misinformation can spread so fast via the internet. It is critical that the government addresses this issue as transparently as possible. It needs to restore public trust in the measles vaccine and other vaccines that have evidenced track records of safety and effectiveness. Oh, my. This is terrible. Like Shirley S says maybe measles is evolving as well. Many viruses are. I too remember having to stay in a dark room. Thanks for sharing. Makes me wonder if measles is more virulent than it was when as a child I contracted it but I don't remember feeling particularly sick. I remember being kept in a darkened room with my sister. OUCH.... this is another serious problem..